Well there I was the other day, wrapping my older sister's present ready for when she came for tea, when OMG!!! I had forgotten to make a card! (tell me how that is possible????) So this is what I "whipped up" - literally! It took all of 15 minutes and as I was making it I was thinking "this isn't working putting all of these different patterns together" but when I finished I really liked it! So did my other sister who had turned up right at the end of the panic attack. LOL Maybe not everybody's cup of tea but I like it. Anyway my other sister's birthday was three days later so I had more time (but still did it at the last minute LOL - I wouldn't be me if I was organised! 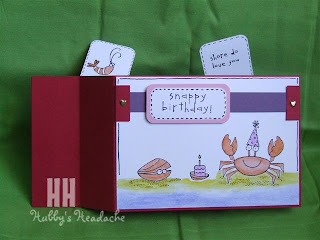 LOL) She likes cards that "pop out/up" so I cased this idea from a tutorial by Diane Zechman on the Scor-Pal site. It's called a "Windshield Wiper Card". When I say cased I really mean copied LOL as it is very very similar to her card (different stamp set and a couple of minor colour changes) but hers was soooo cute!!! She used the SU set "Unfrogettable" which I haven't got but it will have to go on my wish list because it always makes such cute, adorable cards. 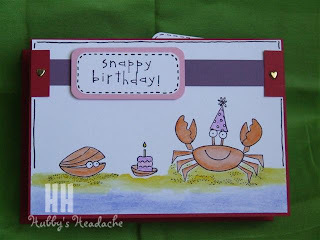 On that note though, I do love the stamp set I used "Crab & Co" as it always makes cute cards also. It was from a mini catalogue last year and yah!!! it has made it into the new SU catalogue! Hi Deb - FAR OUT!!! You have been busy!! Love them all ANDDDDDDDD I love your new banner - WELL DONE!! I love what you've done with patterns - I'm always a bit hesitant and not so daring when it comes to that. Your card looks great. The crab card is just adorable - I love that set. 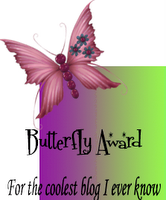 Thanks for looking at my blog! All the best with your SU journey. I saw the new banner last night and meant to comment on it. Pretty cool. Love the card you threw together at the last minute. Excellent. Windshield wiper card pretty good too. Love your cards Deb! Your new banner is fab! 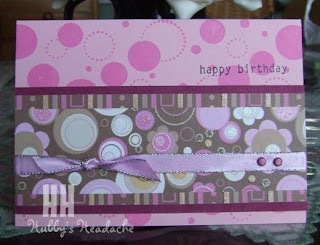 Deb, I love your latest cards - the wiper card is so cute. You have been soooo busy lately. And you are so clever to think of designing your banner with the Family set!